NASA's Voyager 1 has passed into the border region at the edge of the solar system and now is sending back information about this never-before-explored area, say scientists at the University of Maryland. "We have confirmed, for the first time, that Voyager 1 crossed the termination shock on Dec. 16, 2004," said Frank McDonald , a senior research scientist at the university's Institute for Physical Science and Technology, and a coauthor on two of four Voyager 1 papers published in the Sept. 23 issue of Science. The termination shock marks the beginning of a transition region at the edge of the solar system that is known as the heliosheath. 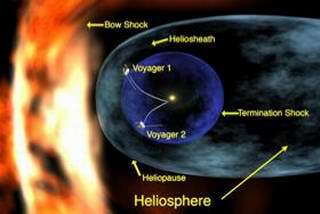 "Until now there has been debate among scientists on whether Voyager 1 had crossed the termination shock as early as 2002 or not until December 16, 2004," said McDonald, who coauthored "Crossing the Termination Shock into the Heliosheath: Magnetic Fields," and "Voyager 1 Explores the Termination Shock Region and the Heliosheath Beyond." Matthew Hill, George Gloeckler and Douglas C. Hamilton, scientists in the University of Maryland's Space Physics Group were among the coauthors of a third article, "Voyager 1 in the Foreshock, Termination Shock and Heliosheath," which presents other new observations on the spacecraft's entrance into the heliosheath. Gloeckler and his Space Physics group built the Low Energy Charged Particle (LCEP) instrument, one of the five main instruments on Voyager. "The termination shock -- a shock wave in the solar wind, that marks the slowing of the supersonic solar wind to subsonic speed -- had been universally thought to be a prodigious accelerator of particles and our findings largely confirm that," said Hill, a research scientist in the department of physics. "This paper describes a remarkable increase in particle intensity with energetic characteristics unlike anything we have seen before. In addition, the LECP instrument indirectly determines that the solar wind speed in the heliosheath is clearly sub-sonic." However, Hill explained that one very surprising finding was that certain particles called "anomalous cosmic rays" do not appear to be accelerated at the termination shock, or at least not in the area where Voyager 1 crossed. This is despite the "near unanimity of opinion" among scientists that these rays would be accelerated. "This finding has the potential to turn three decades of anomalous cosmic ray research on its head," said Hill. Our sun is surrounded by a bubble known as the heliosphere ("helio" means sun) that extends well beyond the solar system's outermost planets. This bubble is formed by the solar wind; electrically charged particles that blow out from the sun at a million miles per hour. As the sun races around the center of our Milky Way galaxy at some 560,000 miles per hour, this bubble, or heliosphere, shoves through the clouds of dust, gas and charged particles that whirl between the stars. At the outer edge of the heliosphere, is the heliosheath, a transition or border region where the solar wind is directly influenced by the pressure of the interstellar clouds through which our solar system travels. Uncertainly about when Voyager 1 entered the heliosheath, stems from the fact that the exact location and size of this transition region are not static, but change based on the relative pressures of the solar wind and the opposing interstellar clouds. The beginning of the heliosheath region is marked by the termination shock, the point at which the solar wind abruptly slows. The termination shock gets its name from the shockwave produced by the slowing of the solar wind. This shockwave is similar to the sonic boom that occurs on Earth when an airplane crosses the subsonic-supersonic barrier. The outermost edge of the heliosheath is the heliopause, which marks the end of our solar system. At the heliopause, the force or pressure of solar wind is stopped, balanced by that of the pressure from the interstellar clouds. Voyager 1 and its twin spacecraft Voyager 2 are now part of a NASA Interstellar Mission to explore the outermost edge of the sun's domain and beyond. Both Voyagers are capable of returning scientific data from a full range of instruments, with adequate electrical power and attitude control propellant to keep operating until 2020. Maryland's McDonald, who has worked on the voyager missions from the beginning, said Voyager 1 should reach the heliopause, or end of the solar system in the next eight to ten years. "When we started none of us thought of this mission lasting this long. Now it has gone 28 years, and there is no reason it can't go on for many more." When the Voyagers were launched in 1977, their mission was to explore the giant planets Jupiter and Saturn. However, after completing their initial assignments, the pair just kept going and going. Voyager 2 went on to explore Uranus and Neptune, the only spacecraft to have visited these outer planets. It now follows its twin and could cross the termination shock and enter the heliosheath by 2008." The Voyagers each carry a message to any extraterrestrials they might encounter. Each messages is carried by a phonograph record - a 12-inch gold-plated copper disk containing sounds and images selected to portray the diversity of life and culture on Earth. Experiments built by the University of Maryland space physics group are currently operating on 13 spacecraft, including the two Voyager spacecraft. Other missions carrying the group's sensors include Cassini, the Ulysses probe to the solar poles and near-Earth missions such as Geotail, the Solar Anomalous and Magnetospheric Particle Explorer (SAMPEX), WIND, the Solar and Heliospheric Observatory (SOHO), and the Advanced Composition Explorer (ACE).